"Crystallizing" and "Crystallized" redirect here. For the song, see Crystalised. For other uses, see Crystallization (disambiguation). Crystallization is the (natural or artificial) process by which a solid forms, where the atoms or molecules are highly organized into a structure known as a crystal. Some of the ways by which crystals form are precipitating from a solution, freezing, or more rarely deposition directly from a gas. Attributes of the resulting crystal depend largely on factors such as temperature, air pressure, and in the case of liquid crystals, time of fluid evaporation. Crystallization occurs in two major steps. The first is nucleation, the appearance of a crystalline phase from either a supercooled liquid or a supersaturated solvent. The second step is known as crystal growth, which is the increase in the size of particles and leads to a crystal state. An important feature of this step is that loose particles form layers at the crystal's surface lodge themselves into open inconsistencies such as pores, cracks, etc. The majority of minerals and organic molecules crystallize easily, and the resulting crystals are generally of good quality, i.e. without visible defects. However, larger biochemical particles, like proteins, are often difficult to crystallize. The ease with which molecules will crystallize strongly depends on the intensity of either atomic forces (in the case of mineral substances), intermolecular forces (organic and biochemical substances) or intramolecular forces (biochemical substances). Crystallization is also a chemical solid–liquid separation technique, in which mass transfer of a solute from the liquid solution to a pure solid crystalline phase occurs. In chemical engineering, crystallization occurs in a crystallizer. Crystallization is therefore related to precipitation, although the result is not amorphous or disordered, but a crystal. The crystallization process consists of two major events, nucleation and crystal growth which are driven by thermodynamic properties as well as chemical properties. In crystallization Nucleation is the step where the solute molecules or atoms dispersed in the solvent start to gather into clusters, on the microscopic scale (elevating solute concentration in a small region), that become stable under the current operating conditions. These stable clusters constitute the nuclei. Therefore, the clusters need to reach a critical size in order to become stable nuclei. Such critical size is dictated by many different factors (temperature, supersaturation, etc.). It is at the stage of nucleation that the atoms or molecules arrange in a defined and periodic manner that defines the crystal structure — note that "crystal structure" is a special term that refers to the relative arrangement of the atoms or molecules, not the macroscopic properties of the crystal (size and shape), although those are a result of the internal crystal structure. The crystal growth is the subsequent size increase of the nuclei that succeed in achieving the critical cluster size. Crystal growth is a dynamic process occurring in equilibrium where solute molecules or atoms precipitate out of solution, and dissolve back into solution. Supersaturation is one of the driving forces of crystallization, as the solubility of a species is an equilibrium process quantified by Ksp. Depending upon the conditions, either nucleation or growth may be predominant over the other, dictating crystal size. Many compounds have the ability to crystallize with some having different crystal structures, a phenomenon called polymorphism. Each polymorph is in fact a different thermodynamic solid state and crystal polymorphs of the same compound exhibit different physical properties, such as dissolution rate, shape (angles between facets and facet growth rates), melting point, etc. For this reason, polymorphism is of major importance in industrial manufacture of crystalline products. Additionally, crystal phases can sometimes be interconverted by varying factors such as temperature. 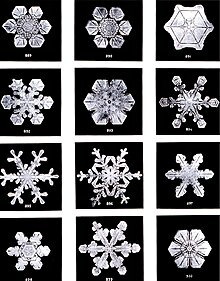 Snowflakes are a very well-known example, where subtle differences in crystal growth conditions result in different geometries. Crystal formation can be divided into two types, where the first type of crystals are composed of a cation and anion, also known as a salt, such as sodium acetate. The second type of crystals are composed of uncharged species, for example menthol. Crystal formation can be achieved by various methods, such as: cooling, evaporation, addition of a second solvent to reduce the solubility of the solute (technique known as antisolvent or drown-out), solvent layering, sublimation, changing the cation or anion, as well as other methods. The formation of a supersaturated solution does not guarantee crystal formation, and often a seed crystal or scratching the glass is required to form nucleation sites. A typical laboratory technique for crystal formation is to dissolve the solid in a solution in which it is partially soluble, usually at high temperatures to obtain supersaturation. The hot mixture is then filtered to remove any insoluble impurities. The filtrate is allowed to slowly cool. Crystals that form are then filtered and washed with a solvent in which they are not soluble, but is miscible with the mother liquor. The process is then repeated to increase the purity in a technique known as recrystallization. For biological molecules in which the solvent channels continue to be present to retain the three dimensional structure intact, microbatch crystallization under oil and vapor diffusion methods have been the common methods. Equipment for the main industrial processes for crystallization. Tank crystallizers. Tank crystallization is an old method still used in some specialized cases. Saturated solutions, in tank crystallization, are allowed to cool in open tanks. After a period of time the mother liquor is drained and the crystals removed. Nucleation and size of crystals are difficult to control. Typically, labor costs are very high. Low-temperature SEM magnification series for a snow crystal. The crystals are captured, stored, and sputter-coated with platinum at cryo-temperatures for imaging. The crystallization process appears to violate the second principle of thermodynamics. Whereas most processes that yield more orderly results are achieved by applying heat, crystals usually form at lower temperatures—especially by supercooling. However, due to the release of the heat of fusion during crystallization, the entropy of the universe increases, thus this principle remains unaltered. Regarding crystals, there are no exceptions to this rule. Similarly, when the molten crystal is cooled, the molecules will return to their crystalline form once the temperature falls beyond the turning point. This is because the thermal randomization of the surroundings compensates for the loss of entropy that results from the reordering of molecules within the system. Such liquids that crystallize on cooling are the exception rather than the rule. As mentioned above, a crystal is formed following a well-defined pattern, or structure, dictated by forces acting at the molecular level. As a consequence, during its formation process the crystal is in an environment where the solute concentration reaches a certain critical value, before changing status. Solid formation, impossible below the solubility threshold at the given temperature and pressure conditions, may then take place at a concentration higher than the theoretical solubility level. The difference between the actual value of the solute concentration at the crystallization limit and the theoretical (static) solubility threshold is called supersaturation and is a fundamental factor in crystallization. Nucleation is the initiation of a phase change in a small region, such as the formation of a solid crystal from a liquid solution. It is a consequence of rapid local fluctuations on a molecular scale in a homogeneous phase that is in a state of metastable equilibrium. Total nucleation is the sum effect of two categories of nucleation – primary and secondary. Primary nucleation is the initial formation of a crystal where there are no other crystals present or where, if there are crystals present in the system, they do not have any influence on the process. This can occur in two conditions. The first is homogeneous nucleation, which is nucleation that is not influenced in any way by solids. These solids include the walls of the crystallizer vessel and particles of any foreign substance. The second category, then, is heterogeneous nucleation. This occurs when solid particles of foreign substances cause an increase in the rate of nucleation that would otherwise not be seen without the existence of these foreign particles. Homogeneous nucleation rarely occurs in practice due to the high energy necessary to begin nucleation without a solid surface to catalyse the nucleation. Low kinetic order and rate-proportional to supersaturation, allowing easy control without unstable operation. Occurs at low supersaturation, where growth rate is optimal for good quality. Low necessary energy at which crystals strike avoids the breaking of existing crystals into new crystals. The quantitative fundamentals have already been isolated and are being incorporated into practice. b is an empirical exponent that can range up to 5, but is generally 2. Once the first small crystal, the nucleus, forms it acts as a convergence point (if unstable due to supersaturation) for molecules of solute touching – or adjacent to – the crystal so that it increases its own dimension in successive layers. The pattern of growth resembles the rings of an onion, as shown in the picture, where each colour indicates the same mass of solute; this mass creates increasingly thin layers due to the increasing surface area of the growing crystal. The supersaturated solute mass the original nucleus may capture in a time unit is called the growth rate expressed in kg/(m2*h), and is a constant specific to the process. Growth rate is influenced by several physical factors, such as surface tension of solution, pressure, temperature, relative crystal velocity in the solution, Reynolds number, and so forth. Flow pattern, again as an index of the probability of a molecule of solute to come into contact with an existing crystal (higher in laminar flow, lower in turbulent flow, but the reverse applies to the probability of contact). The appearance and size range of a crystalline product is extremely important in crystallization. If further processing of the crystals is desired, large crystals with uniform size are important for washing, filtering, transportation, and storage, because large crystals are easier to filter out of a solution than small crystals. Also, larger crystals have a smaller surface area to volume ratio, leading to a higher purity. This higher purity is due to less retention of mother liquor which contains impurities, and a smaller loss of yield when the crystals are washed to remove the mother liquor. The theoretical crystal size distribution can be estimated as a function of operating conditions with a fairly complicated mathematical process called population balance theory (using population balance equations). This division is not really clear-cut, since hybrid systems exist, where cooling is performed through evaporation, thus obtaining at the same time a concentration of the solution. A crystallization process often referred to in chemical engineering is the fractional crystallization. This is not a different process, rather a special application of one (or both) of the above. Most chemical compounds, dissolved in most solvents, show the so-called direct solubility that is, the solubility threshold increases with temperature. So, whenever the conditions are favourable, crystal formation results from simply cooling the solution. Here cooling is a relative term: austenite crystals in a steel form well above 1000 °C. An example of this crystallization process is the production of Glauber's salt, a crystalline form of sodium sulfate. In the diagram, where equilibrium temperature is on the x-axis and equilibrium concentration (as mass percent of solute in saturated solution) in y-axis, it is clear that sulfate solubility quickly decreases below 32.5 °C. Assuming a saturated solution at 30 °C, by cooling it to 0 °C (note that this is possible thanks to the freezing-point depression), the precipitation of a mass of sulfate occurs corresponding to the change in solubility from 29% (equilibrium value at 30 °C) to approximately 4.5% (at 0 °C) – actually a larger crystal mass is precipitated, since sulfate entrains hydration water, and this has the side effect of increasing the final concentration. A decrease in temperature usually implies an increase of the viscosity of a solution. Too high a viscosity may give hydraulic problems, and the laminar flow thus created may affect the crystallization dynamics. It is not applicable to compounds having reverse solubility, a term to indicate that solubility increases with temperature decrease (an example occurs with sodium sulfate where solubility is reversed above 32.5 °C). The simplest cooling crystallizers are tanks provided with a mixer for internal circulation, where temperature decrease is obtained by heat exchange with an intermediate fluid circulating in a jacket. These simple machines are used in batch processes, as in processing of pharmaceuticals and are prone to scaling. Batch processes normally provide a relatively variable quality of product along the batch. The Swenson-Walker crystallizer is a model, specifically conceived by Swenson Co. around 1920, having a semicylindric horizontal hollow trough in which a hollow screw conveyor or some hollow discs, in which a refrigerating fluid is circulated, plunge during rotation on a longitudinal axis. The refrigerating fluid is sometimes also circulated in a jacket around the trough. Crystals precipitate on the cold surfaces of the screw/discs, from which they are removed by scrapers and settle on the bottom of the trough. The screw, if provided, pushes the slurry towards a discharge port. A common practice is to cool the solutions by flash evaporation: when a liquid at a given T0 temperature is transferred in a chamber at a pressure P1 such that the liquid saturation temperature T1 at P1 is lower than T0, the liquid will release heat according to the temperature difference and a quantity of solvent, whose total latent heat of vaporization equals the difference in enthalpy. In simple words, the liquid is cooled by evaporating a part of it. In the sugar industry, vertical cooling crystallizers are used to exhaust the molasses in the last crystallization stage downstream of vacuum pans, prior to centrifugation. The massecuite enters the crystallizers at the top, and cooling water is pumped through pipes in counterflow. Another option is to obtain, at an approximately constant temperature, the precipitation of the crystals by increasing the solute concentration above the solubility threshold. To obtain this, the solute/solvent mass ratio is increased using the technique of evaporation. This process is insensitive to change in temperature (as long as hydration state remains unchanged). All considerations on control of crystallization parameters are the same as for the cooling models. Most industrial crystallizers are of the evaporative type, such as the very large sodium chloride and sucrose units, whose production accounts for more than 50% of the total world production of crystals. The most common type is the forced circulation (FC) model (see evaporator). A pumping device (a pump or an axial flow mixer) keeps the crystal slurry in homogeneous suspension throughout the tank, including the exchange surfaces; by controlling pump flow, control of the contact time of the crystal mass with the supersaturated solution is achieved, together with reasonable velocities at the exchange surfaces. The Oslo, mentioned above, is a refining of the evaporative forced circulation crystallizer, now equipped with a large crystals settling zone to increase the retention time (usually low in the FC) and to roughly separate heavy slurry zones from clear liquid. Evaporative crystallizers tend to yield larger average crystal size and narrows the crystal size distribution curve. Whichever the form of the crystallizer, to achieve an effective process control it is important to control the retention time and the crystal mass, to obtain the optimum conditions in terms of crystal specific surface and the fastest possible growth. This is achieved by a separation – to put it simply – of the crystals from the liquid mass, in order to manage the two flows in a different way. The practical way is to perform a gravity settling to be able to extract (and possibly recycle separately) the (almost) clear liquid, while managing the mass flow around the crystallizer to obtain a precise slurry density elsewhere. A typical example is the DTB (Draft Tube and Baffle) crystallizer, an idea of Richard Chisum Bennett (a Swenson engineer and later President of Swenson) at the end of the 1950s. The DTB crystallizer (see images) has an internal circulator, typically an axial flow mixer – yellow – pushing upwards in a draft tube while outside the crystallizer there is a settling area in an annulus; in it the exhaust solution moves upwards at a very low velocity, so that large crystals settle – and return to the main circulation – while only the fines, below a given grain size are extracted and eventually destroyed by increasing or decreasing temperature, thus creating additional supersaturation. A quasi-perfect control of all parameters is achieved as DTF crystallizers offer superior control over crystal size and characteristics. This crystallizer, and the derivative models (Krystal, CSC, etc.) could be the ultimate solution if not for a major limitation in the evaporative capacity, due to the limited diameter of the vapour head and the relatively low external circulation not allowing large amounts of energy to be supplied to the system. ^ Lin, Yibin (2008). "An Extensive Study of Protein Phase Diagram Modification:Increasing Macromolecular Crystallizability by Temperature Screening". Crystal Growth & Design. 8 (12): 4277. doi:10.1021/cg800698p. ^ Chayen, Blow (1992). "Microbatch crystallization under oil — a new technique allowing many small-volume crystallization trials". Journal of Crystal Growth. 122 (1–4): 176–180. Bibcode:1992JCrGr.122..176C. doi:10.1016/0022-0248(92)90241-A. ^ Benvenuti, Mangani (2007). "Crystallization of soluble proteins in vapor diffusion for x-ray crystallography". Nature Protocols. 2: 1663. doi:10.1038/nprot.2007.198. ^ a b Tavare, N. S. (1995). Industrial Crystallization. Plenum Press, New York. ^ a b McCabe & Smith (2000). Unit Operations of Chemical Engineering. McGraw-Hill, New York. ^ "Crystallization". www.reciprocalnet.org. Archived from the original on 2016-11-27. Retrieved 2017-01-03. ^ "Submerge Circulating Crystallizers - Thermal Kinetics Engineering, PLLC". Thermal Kinetics Engineering, PLLC. Retrieved 2017-01-03. ^ "Draft Tube Baffle (DTB) Crystallizer - Swenson Technology". Swenson Technology. Archived from the original on 2016-09-25. Retrieved 2017-01-03. S.J. Jancic, P.A.M. Grootscholten: “Industrial Crystallization”, Textbook, Delft University Press and Reidel Publishing Company, Delft, The Netherlands, 1984.